We are the award-winning, Bay Area production studio, Little Fluffy Clouds, founded by three Europeans in America, Betsy De Fries, Jerry van de Beek + JAX the dog. We specialize in high-end motion graphics and animation in all its forms. Talented, imaginative, experimental yet pragmatic we bring a unique edge to everything we do. Our compulsion for storytelling, interwoven with a constant eye for exploration, development and investment in the latest technologies, allows us to think freely, playfully question, concept, dream, draw, code, animate and deliver experiences that enable our client's ideas to shine. Diversity of style is the Little Fluffy Clouds watchword. Jerry is LFC’s co-founder and director of many award-winning productions. He likes nothing more than experimenting with the latest software to ensure that he remains at the forefront of new technologies. Staying hands-on, by applying his designs in 2D, 3D, VFX and live-action, he mixes up the usual to arrive at the unusual. Jerry also programs, forging pioneering techniques for the seamless integration of traditional and digital animation, used in such industry awarded commercials as, Mainstay’s Up…Down...Up and his many Coca~Cola spots. He is always in the avant garde of all techniques relating to design, animation, AR, VR, interactive projects. 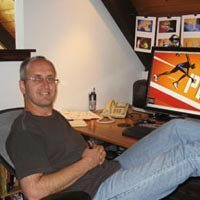 Prior to LFC Jerry worked for some of the best production houses in Europe before setting sail for the US to join Colossal Pictures in San Francisco as an animation director. Jerry is an avid photographer using the medium as the means to capture a narrative in real time. His animations are often seen on the international animation festival circuit and in multiple art publications. 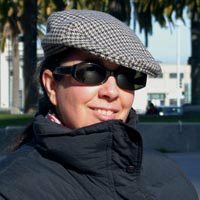 Writer, poet and mixed media artist, Betsy is also LFC’s founder, art director and producer. Her checkered past includes theatres, nightclubs, performance spaces and international art collectives. Prior to LFC Betsy was Senior Producer for New Media & Interactivity at the legendary, animation powerhouse, Colossal Pictures. After many years spent on live action sets as a scenic painter, set dresser, stylist and art director, she opted for the relative sanity of emerging new media, first producing, Where Next Columbus: Mission to Mars, the Smithsonian’s National Air & Space Museum’s longest running interactive exhibit. Betsy then joined the creative team at Apple Computer’s Discovery/Zenda Studio. A stint at Paramount Media Kitchen, conceiving and producing interactive TV pilots, eventually led her back to the extremely production oriented Colossal Pictures and finally to found Little Fluffy Clouds. Betsy’s work can be seen on the international animation festival circuit and in multiple art publications. Betsy hales from London but now lives happily in California with her dog, JAX. Taschen GmbH 2005 - Animation Now!